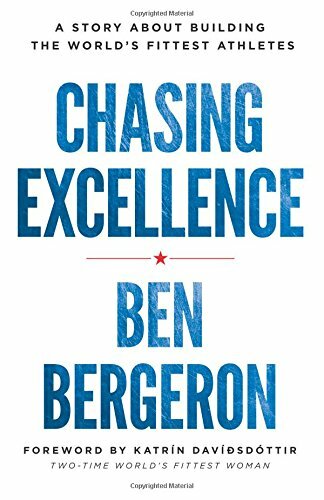 Chasing Excellence by Ben Bergeron is a must-read for anyone looking to improve their lives either in sports, professions, or any goal you may have. Bergeron is a well-known name in CrossFit. He trains CrossFit Games athletes and champions including Mat Fraser and Katrin Davidsdottir. Many affiliates follow his programming (including us). He is top notch in the CrossFit industry. His premise is this: train the person (character), the process (maximizing every minute of every day), ability (training), and strategy (plan). This is his pyramid for success. Day in and day out. You have to have a plan to get where you’re going. You have to be willing to sacrifice every day, making small gains which will add up to the large jumps for success in life. You have to commit to the process of achieving your plan through developing character traits–grit, resilience, accountability, confidence, optimism, perseverance, and passion. You have to stay positive and focus only on the things you can control (nutrition, recovery, sleep, mindset, and training) and ignore everything else–the things you can’t control. Embrace adversity–the struggle is what grows us. Not complacency or doing the things we’re good at or staying in our comfort zone. We only grow when we take risks and do the uncomfortable things. You have to give your best at every moment. You are only competing against yourself ever–never anyone else. The goal is to know in your heart you gave your best effort every day in every situation. Practice must be deliberate. You must maximize every minute of every day. Focus on the small steps that will lead to the big results. We are our habits; we are the sum of what we repeatedly do. Create the right mindset. Live in the moment. Let go of the past. Don’t worry about the future. Focus on what you can control. Readily admit your problems and focus on them to change them. Success is a decision. You must take action. Do your best at whatever you do. Overall, Bergeron says excellence is a habit. You must take advantage of every opportunity every day. Clarify what you really want and then work as hard as you can for as long as it takes. This was exactly the book I needed to read at this exact moment in my life. I had been diligent in some areas of my life but complacent in others–the big one being nutrition. Eating healthy is a decision. “Cheat” days shouldn’t be every day or even every week. Excellence is a mindset. It’s hard work. It’s sacrifice. It’s clarity. This is a book you can apply to all areas of your life and all goals. It’s prompted me to really sit down and figure out what are my goals and how to reach them. I don’t have all the answers, but I have more than yesterday and that’s a start! Happy reading! !